I knew I was a long way from home when I passed a pickup truck filled with carcasses. 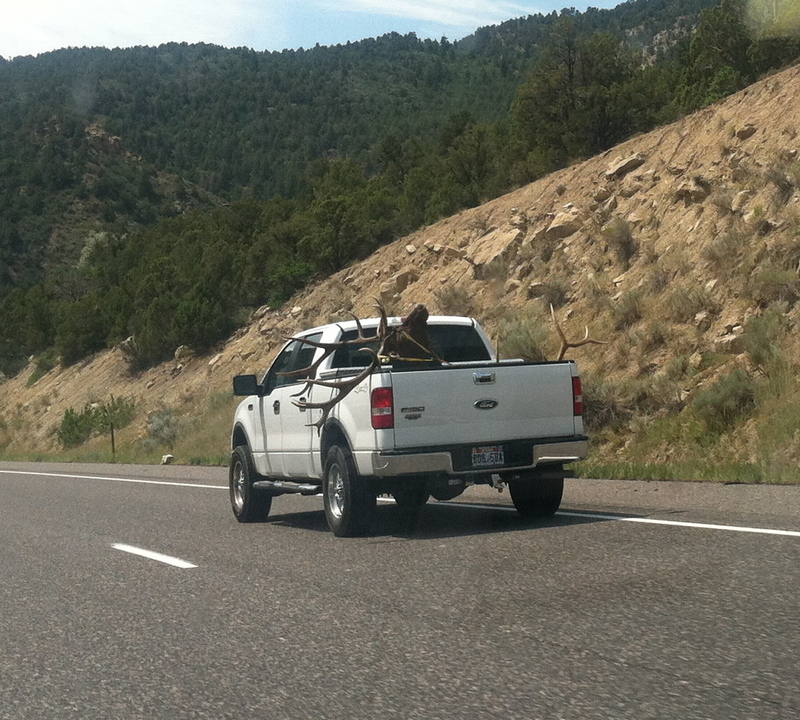 The enormous elk horns were sticking way over the side and the driver had to keep far to the right of the lane in order not to skewer something. It rather sickened me to see the beautiful head distorted at a weird angle and the pile-o-antlers in the white truck bed. 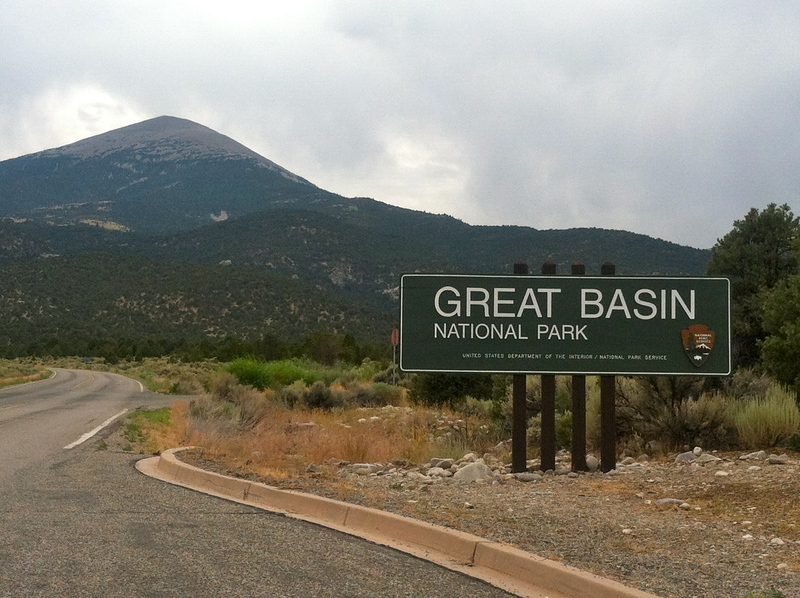 I found a little known national park in Nevada called Great Basin National Park. It was unexpected to see mountains on the eastern edge of what is typically considered a desert state. Unfortunately I arrived late and there was an impending thunder-storm so I didn’t explore it fully. But I drove for miles on a gravel road and took an hour-long hike. 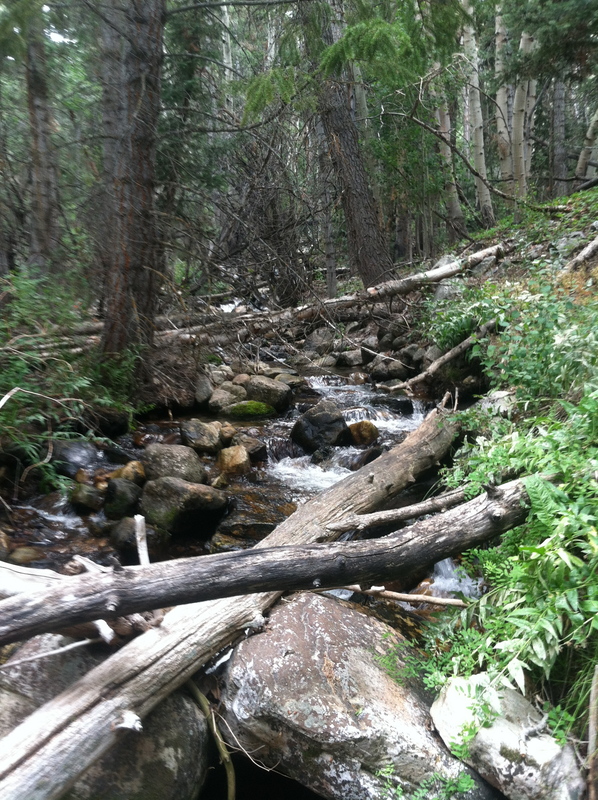 I gravitate toward the sound of running water because of my blog namesake poem…. …so on the hike when I heard a trickling in the distance I cut through the brush to find a delightful stream to dream by for a while. 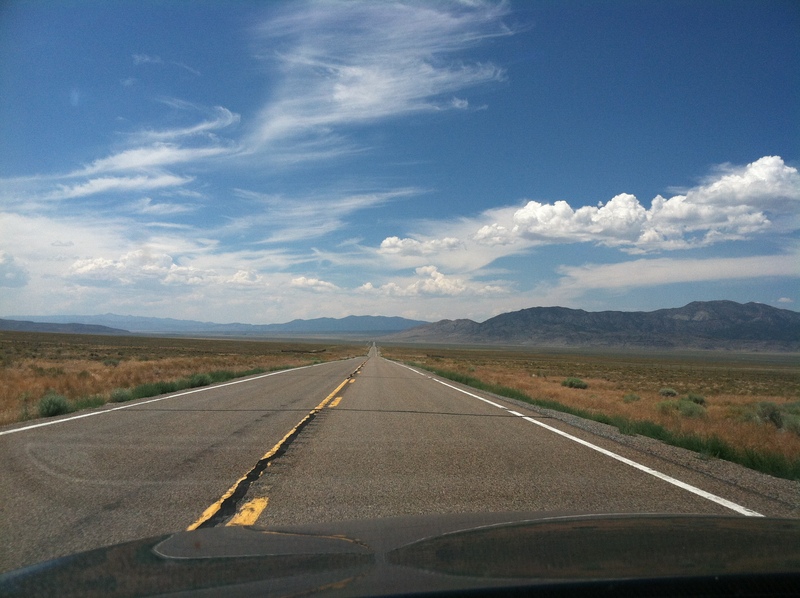 Ely, Nevada was my destination for the night. It is a small town and I asked at the hotel desk for a restaurant that served fresh vegetables. The gal pondered a moment and then suggested the Chinese food restaurant and gave me directions. I found the place with a big CLOSED sign on the door and so I called back to the hotel for further advice. The line went quiet for a moment then she said the only other place was the Hotel Nevada Casino. Now I’m not a casino fan, but it was getting late and I was getting hungrier by the minute. I had put off eating and as anyone knows who knows me well, I can get cranky if I wait too long to eat. 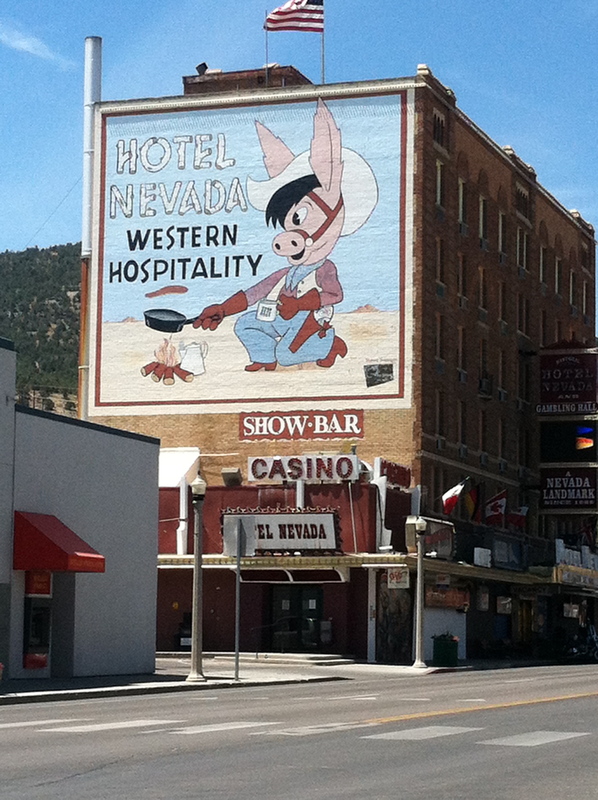 So off I went to the Hotel Nevada with a sinking heart, imagining smorgasbord buffets, cigarette smoke and bright lights. I was so pleasantly surprised to find a rather rustic looking restaurant inside the small casino and I was seated at a booth by a friendly waitress. She shared the daily specials and as she did so the couple in the next booth piped in that the steak special with melted blue cheese was PHENOMENAL. They were just finishing it and raved. Here I was hoping for a healthy meal but when confronted with such enthusiasm I caved in and order it with baked potato and all. We chatted while I waited for my steak. The couple was bicycling across the United States and they, too, had met with grand adventures and nothing but positive people. They excused themselves as they had to get to bed early in order to be up at 2 am to go through the hot desert stretch of Nevada. I was full of admiration as I bid them good-bye. 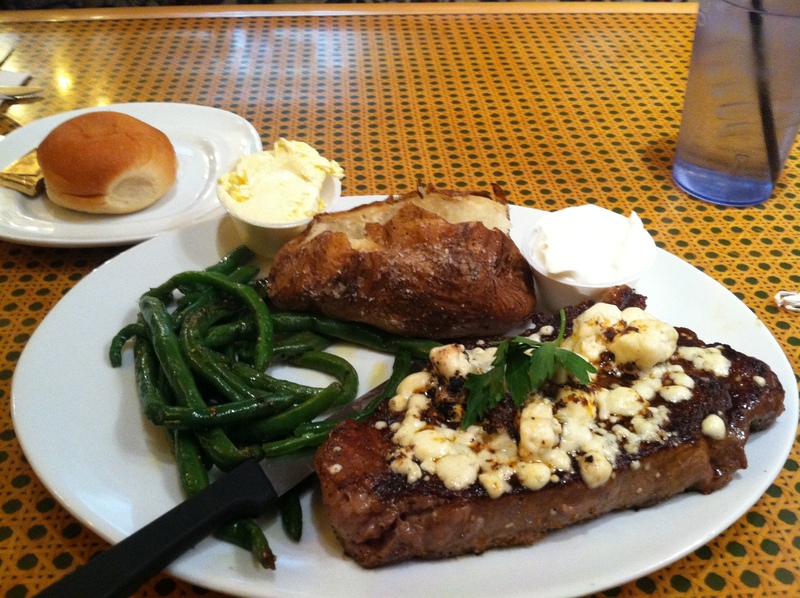 My steak arrived and was one of the best steaks I have ever had! My mouth waters just thinking back on it. I savored every bite and took a large portion to go. As I was getting ready for my check two gentlemen arrived and sat at a nearby table and as there were only a few of us in attendance on a quiet Sunday night I waved and said hello. You probably can guess, if you’ve been reading my blog, what comes next. The sweet waitress brought my bill and as she was setting it on the table one of the two men said “Give us that. We can buy a pretty girl her dinner.” I grinned, waved the bill at them and said, “Oh, no, this was not cheap, it was the steak special for $16.95!!! They urged me further and the waitress winked and said “Oh, Honey, let them buy you dinner.” So I demurred, a bit embarrassed, but very thankful. I went over on my way out to thank them again. They were Texas oil men in Ely to tour and possibly purchase some gold mines. One of the gentleman pulled out a little vial of rocks in liquid from his pocket, “You ever seen gold in it’s raw form?” I had to admit that other than fools gold from California riverbanks, I had not. The dull, brown stones were hardly impressive. They were charming and sweet to ask about me and were surprised, as most people are, that I am journeying alone. I thanked them once again and went on my merry way, thankful that the Chinese restaurant went out of business so I could meet and be charmed and treated like a southern belle for an evening. What lovely people we have in this world and I really hope I am able to give as much as I am receiving.